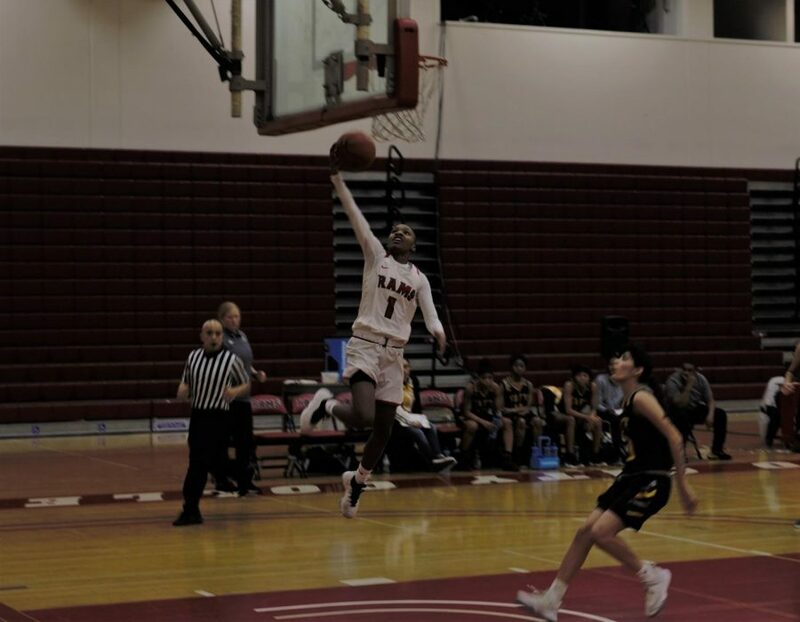 Jerrene Richardson goes up for a layup against Taft College on Jan. 16, 2019. The Fresno City College Rams (13-6, 1-1 conference) faced off against the Taft College Cougies (2-13, 0-3 conference) on Wednesday, looking to rebound from a tough loss to College of the Sequoias. After a dominating 103-52 victory, they seem to be on the right track. In a game that saw everything from tight competition to dominating defense, first year head coach Alex Fletcher had high praise for his team by the end of the evening. The game initially was quite a bit closer than the ending score would indicate, with FCC trailing at the end of the first quarter, 16-15. The sixteen points scored in the first quarter by Taft would however equal their total output in the 2nd and 3rd quarters combined. Starting the second quarter, FCC’s defense clicked and the Rams dominated, scoring 32 points. Led by the 27 point effort by sophomore guard Jerrene Richardson, the Rams rallied, holding Taft to only five points in the second quarter. Richardson also tallied five rebounds, seven assists and six steals in the contest. Nearing the end of the quarter, FCC fans and players collectively held their breath, as Richardson and sophomore forward Alyssa Roberson collided. Both went down hard. Roberson walked off under her own power, while Richardson was escorted off forcing the Rams to change their lineups. “They’re both okay. It was just a little bit of a collision but they both seemed fine,” Fletcher said of his sophomore players. With Richardson and Roberson both returning by the third quarter, the Rams continued to dominate the Cougies, increasing their already impressive lead by scoring 35 in the third quarter. Taft continued to press in the fourth quarter, but trailing by 50 points, it was too little too late. “Fresno City has a great tradition of winning a lot of games, and we’re trying to follow in the footsteps of previous teams, and I think it all has to start with our defense,” Fletcher said of the Rams, who improved to 1-1 in conference play. If defense leads to 103 points, Rams fans would likely agree. The Rams next home game is against Porterville College (3-13, 0-2 conference) on Saturday, Jan. 19 in the FCC gymnasium.